"No price is too low for a bear or too high for a bull." "When one door closes, another opens, but it's hell in the hallway." Financial markets, and to varying degrees real estate markets, in this day and age are so full of regulatory noise, i.e. Federal/State/Local government, Federal Reserve, interest rates etc., it becomes, in the words of Jared Dillian at Mauldin Economics, and I paraphrase, "easier to bet on the politics of the market than the actual market itself." For those who have read my posts over the last several years know that I have bet against continued Fed interest rate hikes despite Fed governor chatter otherwise. Nonetheless, as more datasets and charts have been released I felt it wise to revisit my zero interest rate increase assertion and provide those charts which, in turn, mold my perception of the market. As such, this post is going to focus specifically on the market's perception of a potential interest rate hike at the Fed's meeting on March 15th. (1) The top chart is Citigroup's Economic Surprise Index, or CESI, which tracks how economic data are faring relative to expectations. The index rises when economic data exceed economists' consensus estimates and falls when data come in below estimates. In July 2016 the data broke through its 18-month sub-zero hiatus, only to plummet back pre-election, and has been continuously rising post-election, effectively December 2016. (2) The second chart is US Bloomberg Consumer Confidence and shows the absolute surge in consumer confidence which began in 2012 and is now at its highest point since August 2001 (not shown). (3) The final chart, above, shows a list of Fed governors, both voting and non-voting, and their statements in regards to a potential March rate hike. The news last week was good and seems to indicate that the economy is accelerating early in the new quarter. 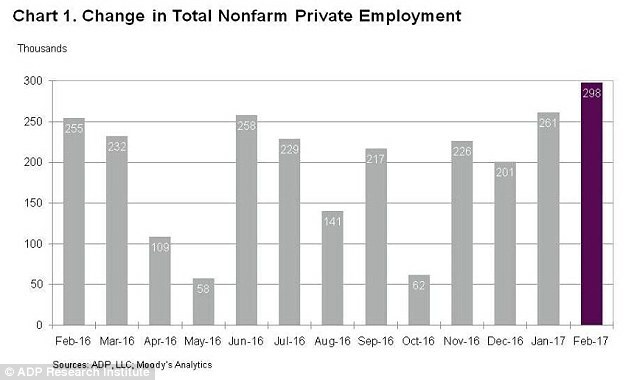 After a mediocre 4th quarter (1.9%), the first quarter of 2017 is shaping up to be better. Consumer confidence, as measured by the Conference Board, is now the highest since August 2001. Manufacturing is looking better, the non-manufacturing sector is expanding, and auto sales remain strong. Home prices are also increasing, but, at a moderate rate. What do all these charts and commentary have in common? 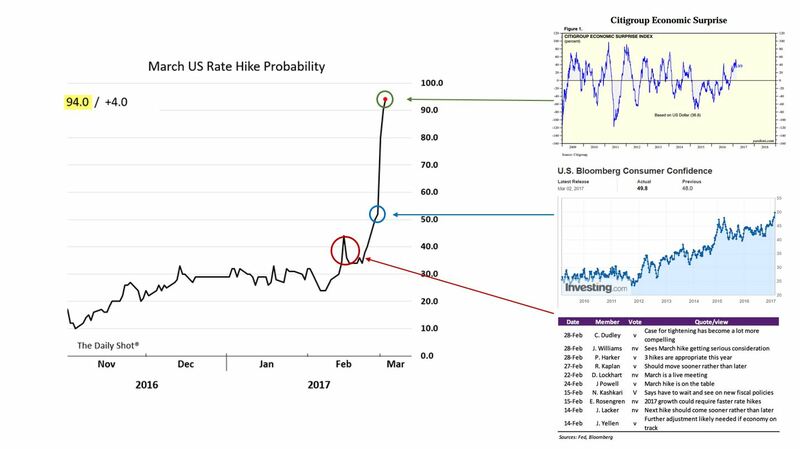 They certainly point to a near universal investor sentiment that a rate hike is not only expected but, perhaps implied, needed. The move to hike in March is significant in large part because it indicates the Fed is on a more aggressive trajectory than the market originally thought. Amid the current economic and political climate — not to mention a national debt quickly approaching $20 trillion — a tighter Fed has many implications. However, Evercore believes the hike should be interpreted not as hawkish, or signaling a more aggressive path to higher rates, but rather as a bullish indicator of confidence in the economy…. the Fed has been basing policy not only on how the U.S. recovery is coming along, but also on how things are shaping up globally. Indications that Europe isn't about to collapse beneath its sovereign debt load and that China has a firmer grasp on its slowing growth have helped contribute to a growing sense of confidence on a global level. (1) About that national debt, according to Peter G. Peterson Foundation, under current law, CBO projects that net interest costs will more than double over the next 10 years, soaring from $270 billion in 2017 to $712 billion in 2026 and totaling $4.8 trillion over the period. 1 Interest costs are expected to continue climbing beyond the next 10 years and are projected to be the third largest category in the federal budget by 2028 (after just Social Security and Medicare), the second largest category in 2046, and the single largest category in 2050. Moreover, as Daniel Amerman explains, if the interest rate on that debt were to rise by even 1%, the annual federal deficit rises by $190 billion. A 2% increase in interest rate levels would up the federal deficit by $380 billion, and if rates were 5% higher, the annual federal deficit rises by $950 billion. 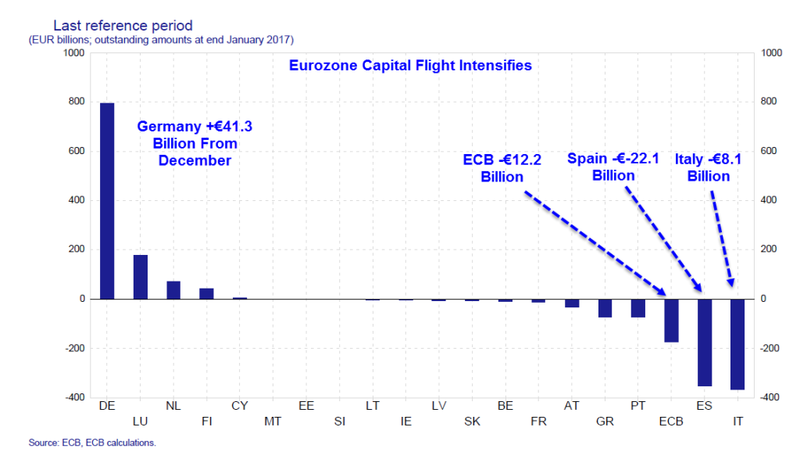 (2) As to Europe, Mike Shedlock from SitkaPacific asserts, if European markets are implied to be stabilizing, I believe capital movement speaks much louder than words…. For reference, Target2 stands for Trans-European Automated Real-time Gross Settlement System. It is a reflection of capital flight from the "Club-Med" countries in Southern Europe (Greece, Spain, and Italy) to banks in Northern Europe. As capital moves more towards Germany it will be interesting to see if the trend of German based funds buying US real estate increases as detailed in a previous article. Although currently not a huge trend could certainly become more of a force with looming European elections and the prospect of continued European instability very much a possibility. Neither I, nor anyone else, have a crystal ball which can portend future interest rate hikes. At best, all we can collectively do is read the same tea leaves and make our best assessment based on our current financial, life and investment positions. I firmly believe the Fed, and Federal Government, has unwittingly, although points can be made for wittingly, positioned itself between a rock and a hard place, i.e. no room to move interest rates should recession hit, ballooning national debt and a world plagued by crisis. Although none of these will turn catastrophic with a nominal bump in the Fed Funds rate by 25 to 50 bps come March 15th, it must be, if not 'the' but 'a', lens through which we see the current market. Personally, I see the Fed very concerned about global financial markets with the US gradually becoming the final safe investment harbor. Take this sentiment and juxtapose it next to Trump who (#1) by previous profession alone loves debt (can be both good and bad), (#2) with a preference for debt, it's reasonable to assume Trump wants a Federal Reserve willing to inflate and weaken the dollar in favor of trade and (#3) Trump gets to add four of his own people to the Federal Reserve within the year. With this in mind, I leave you to make your own interest rate predictions. Happy investing!